Kenilworth Products Ltd. (Now Clondalkin Group) provides pharmaceutical labeling products. The Company offers labels and labeling machinery for eye-droppers, syringes, inhalers, bottles blood bags, tablet containers, and dosing containers. Kenilworth offers its products to pharmaceutical companies throughout Ireland and internationally. Pharmaceutical packaging manufacture, as is with other industries such as food, require production facilities to be secure. Before these higher standards were introduced the simple solution to cooling the factory was to open the doors and windows. Since this is now not possible due to the potential ingress of contaminants, pests and other conditions, an alternative had to found to maintaining a comfortable and productive environment. The company reached out to EcoCooling, requesting a fresh air cooling solution to help cool their factory as well as not break the bank. Since the company used the simple method of opening doors and windows to cool down the building before, they were not prepared to pay for a traditional air condition system that caused their electricity bill to increase. The solution for EcoCooling was simple. Two roof mounted down discharge EcoCoolers were installed feeding air to eight-way plenum chambers. Each EcoCooler is manually controlled which allows 5 fan speeds and the option of ‘Cool’ or ‘Vent’ Mode. EcoCoolers contain an inbuilt fan and evaporative cooling pads. The evaporative coolers are designed to be externally mounted and should be used as part of a mechanical ventilation system with a paired extract fan. The standard configuration is down-flow, where the air is supplied from the base of the cooler into the area that requires cooling. 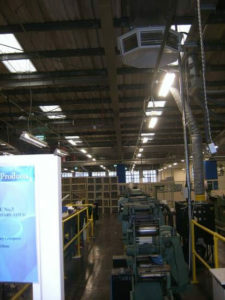 In the plate making area, there is a specific requirement for temperature control. 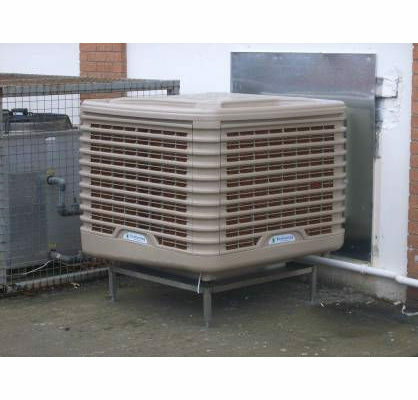 A floor mounted side discharge EcoCooler was installed feeding a ducted air distribution system. A thermostat, located within the plate making area, is used to control the airflow and cooling mode. Kenilworth products were able to maintain their flow of fresh air throughout the building as well as incorporate cooling into specific areas through the use of the flexible and dynamic EcoCoolers.